Openly communicate with your children. Listen to their concerns. 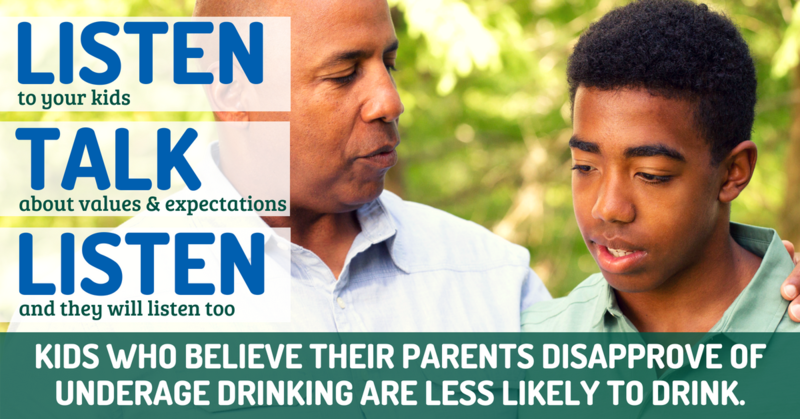 Share why you disapprove of underage drinking and other substance use. Be realistic and understanding about the pressures they are facing. Help youth find risk taking activities that are healthy. Learn more at bit.ly/sapcrisks. Learn more about the risks at bit.ly/sapcbrain. 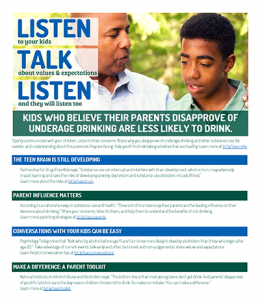 According to a national survey on substance use and health, “Three out of four teens say their parents are the leading influence on their decisions about drinking.” Share your concerns, listen to theirs, and help them to understand the benefits of not drinking. Learn more parenting strategies at bit.ly/sapcparents. Psychology Today notes that “Kids who try alcohol before age 15 are four times more likely to develop alcoholism than those who begin after age 20.” Take advantage of current events, talk early and often, be honest and non-judgemental, share values and expectations. Learn helpful conversation tips at bit.ly/sapcconversations. Brought to you by the Watertown, Waltham, Belmont, Brookline Substance Abuse Prevention Collaborative funded by the MA Department of Public Health Bureau of Substance Addiction Services.